A négociant is the French term for a wine merchant who assembles the produce of smaller growers and winemakers and sells the wine under its own name. The modern-day equivalent is an outfit that buys wine really cheap from a local or domestic producer (usually a winery) or an international importer; then sells the wine at a higher wholesale price to retailers, who then sell the wine at even higher prices to you, dear consumer. These soldiers of fortune, these descendants of the French Foreign Legion, often do so through a “book” of offerings, here and there emphasizing certain wines through tastings with store owners or “blow out” specials focusing on the latest deal. The less ethical flout the law by using a third party to compensate the retailer for pressing a brand. Leaving a 60-inch flat-screen TV at the home of Mister and Missus Retailer, for example. The river road winds through quickly molting deciduous trees, their colorful detritus littering the road like so much Mardi Gras confetti in a beer and blood-red hurricane bath. This journey takes us to the south-side ‘burbs, to that village by the lake which is more Lovejoy than Hawthorne, to a neighborhood market for the well-heeled, where, tonight, the Pirate Négociant is sharing his cadre of wines with the oeno-curious. The damn parking lot is teaming with SUVs and Volvo Cross-Country wagons, over-flowing into the distant reaches of the parking lot once left for employee use. Free food? A Thursday-night soup kitchen for the well-fed? Why, it’s the “Fall Wine Event!! !” (the sign over the entrance exclaims)—an oenogasm of earthly delights and grape derivatives! The store is jammed with consumers conspicuously consuming. Consumers of every stripe: moms, dads, grannies, elders and the not-so-elderly, all over 21, of course. 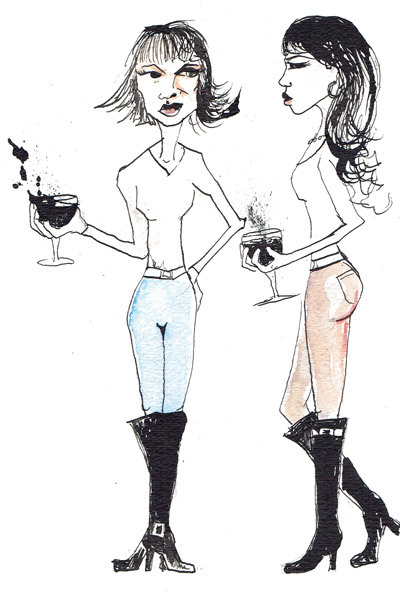 They are coiffed and un-coiffed, seemingly by consensus, shod in tall black boots…and leggings. Lots of leggings. Leggings and black boots. The uniform of the Fall Wine Event. It is here we find our hero: Shimmer, the Pirate Négociant. Standing back from his table, sipping a pinot borne of the Purple Hands of Wright’s son from a real wine glass, not some plastic hospital pill cup they usually hand out at these events, Shimmer watches a happy codger and his one true love resampling a luxurious and “terrifically affordable” viognier. Shimmer has the eye of a dodger considering his mark. “Wadda ya think?” Shimmer queries the codger, the corner of his mouth rising in anticipation. Dunno, dear grocer. Your store, your party, not mine. Shimmer catches my eye. Aye. Buzz. The tony neighborhood grocery is transformed. I’m transfixed. There’s hummus and pita chips in the paper-products aisle. A beer and ale bash is raging in the dairy section, shoppers sipping holiday hops amid the organic yogurt and the cottage cheese. Squeezing through the throng on my way to produce, I come across a sausage tasting that has transformed into some sort of spontaneous pogrom. Back in the store, the wine-tasting tables extend amid the melons and mangoes all the way past the potato pen, taking a soft right after the nut bin. There they transition past the Kobe and the rack of lamb in the meat counter case before ending in the one true wine section. The hold is full of bounty. The pirate is ready to sail. We chart a course downwind, out the doors, and set sail, purple-lipped consumers bobbing about, the wake at our stern. We alight in the village for a feast of Puglian portions at a cucina called Tucci. After washing ashore (having barely escaped the treachery of the Rosenblum Rockpile zin) we set a course for Montalcino. It’s Brunello time! What’s the secret to this industry renegade, anyway? 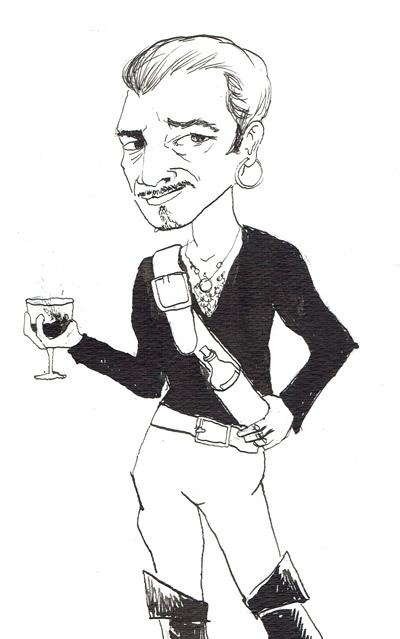 Who is this scalawag wanted in the Northwest wine forest for high crimes and misdemeanors? His treason: daring to give back to those who dare to make the wine. Blasphemy! Like any good pirate, Shimmer was no good being first mate. He worked for his father awhile, but Shimmer the Graybeard and his progeny didn’t sextant the equator the same. Workin’ for the man is buzzard food, even when the man is your old man. Shimmer knew he needed his own crew. His silver hoop earring shines in the light cast off by the hardwood flat bread oven as he washes down a lamb sugo pappardella with sangiovese grosso. His partner, a rum runner by night and financier by day, gave Shimmer his command, and they’ve set a hard course for the Northwest Barbary ever since. And the provocateurs and petulant paradigmers are taking notice. Then there’s the duchy. They don’t make it easy on the mold-breakers. The king likes a loyal and somnambulant populace. But Capt’n Shimmer and his crew are turning a page on the old ways of doing business. “We work with our wineries,” he says, “not just try to make money off them. We consult. We’re brand builders. We give them feedback. His compass set for distant shores, Shimmer tasks his crew of a dozen plus one to make a difference, to educate and change the thinking of the oeno-oppressed … and to put a few more guineas into the hands of the humble craftspeople that make the beautiful wines he promotes. His harshest condemnation is saved for the frauds that prey upon the unwitting grape-juice lover. Like Robin of the Hood before him, Shimmer stands tall for the little guy, proudly defending the people against the excesses and frauds perpetrated by the crown and its minions. He orders his crew to cast lines and they embark. New lands to discover. New juice to ferment. 2011 Robert Ramsey Counoise, Red Mountain, Washington $35. Ramsey sources counoise to blend with their other Rhone varietals and cuvees like their Le Mien. As Ramsey began to understand the potential of counoise on its own, they were excited and thanked their lucky stars they had enough fruit to bottle some on its own. Like its cousin syrah, counoise is raw, spicy, and thick, but adds smoothness and a meaty quality that is both delicious and interesting. There is not much counoise bottled here in the States. A unique and generous mouthful…! 2010 Ash Hollow Nine Mile Red Blend $22. Comprised entirely of estate fruit—60% merlot and 40% cabernet sauvignon—from the east side of Walla Walla, this wine displays brooding dark fruit with medium tannin, soft leather, and blackberry tones. It is tightly wound, requiring a little patience, while layered with herbaceousness and mineral nuances. This boutique winery aims for ultra-premium quality, while keeping the price affordable. An excellent value.